Despite long-held notions to the contrary, fish do have feelings - but the complexity of their emotional lives still isn't fully understood. 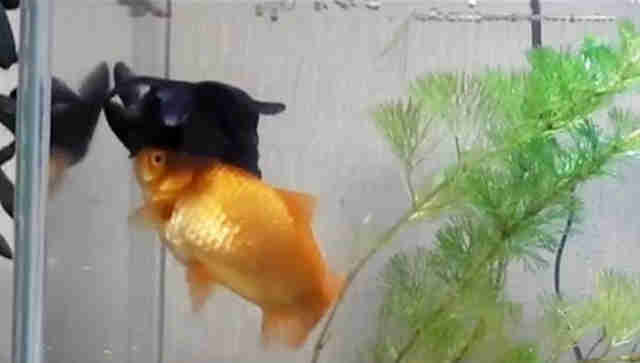 A remarkable video has emerged showing a pet goldfish appearing to help his disabled friend to reach their food floating on the surface. The fishes' owner had noticed the darker of his fish had developed a mobility problem several months ago, but somehow kept from starving to death at the tank's bottom, as RocketNews24 reports. He decided to film the pair at feeding time and discovered something remarkable. The sick fish's counterpart may have been helping to keep him alive. It's unclear whether the fish is truly acting out of kindness for his friend, or if the behavior is something more simplistic. Japanese news outlet Hokkaido Shimbun Press contacted a local aquarium in regard to the behavior seen above, and experts there were stumped, too - but the clip is no less intriguing for that mystery. "As a biologist who specializes in animal behavior and emotions, I've spent the past four years exploring the science on the inner lives of fishes. What I've uncovered indicates that we grossly underestimate these fabulously diverse marine vertebrates. The accumulating evidence leads to an inescapable conclusion: Fishes think and feel." And perhaps they even feel for one another, too.